In scale and in style, the Dartmoor collection of bath faucets and accessories is designed to delight. A gently flaired spout is generously sized, adding beauty and function at the sink. Sculpted handles and finial detailing create a tailored look that's thoroughly classic. Williamsburg-era details and intricate design cues give each Belfield faucet a timeless look. Multiple finish options add a distinctly personalized touch to the traditional styling. A full suite of matching accessories are available to furnish the entire bath. With intricate architectural features that transcend time, Brantford faucets and accessories from MOEN bring a polished, traditional look to any bath. Classic lever handles, a tapered spout and globe finial give this collection universal appeal, while the metal construction offers lasting durability in a rich, oil-rubbed bronze finish. The Brantford 2-Handle Low-Arc Bathroom Faucet comes complete with a matching-finish drain assembly and is WaterSense certified for eco-friendly operation, ensuring efficient water usage with the performance you expect. Featuring intricate architectural details that add a look of grandeur to your bathroom, the MOEN Brantford 8 in. Widespread 2-Handle High-Arc Bathroom Faucet Trim Kit will offer a timeless, elegant appeal to your decor. Boasting an oil-rubbed bronze finish that offers light and dark accents for an antiqued look, this faucet features a classic lever handle, tapered spout and globe finial for versatility. With each understated detail, this trim kit is sure to create an enduring style in your home. This trim kit requires MOEN valve 9000 to complete installation. Dartmoor Oil Rubbed Bronze Two-Handle High Arc Bathroom Faucet In scale and in style, the Dartmoor collection of bath faucets and accessories is designed to delight. A gently flaired spout is generously sized, adding beauty and function at the sink. Sculpted handles and finial detailing create a tailored look that's thoroughly classic. 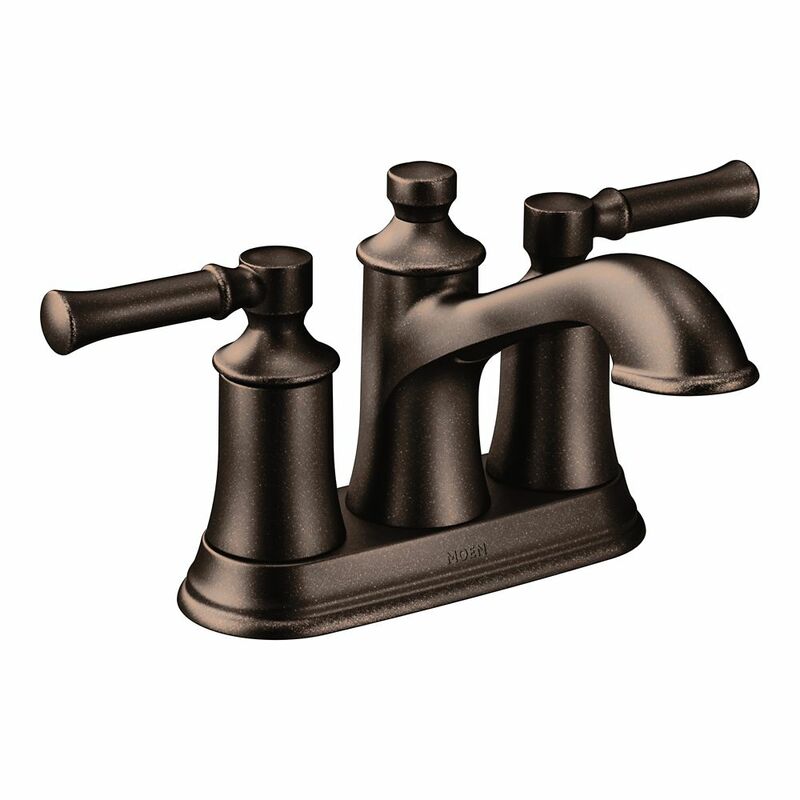 Dartmoor Oil Rubbed Bronze Two-Handle High Arc Bathroom Faucet is rated 4.0 out of 5 by 1. Rated 4 out of 5 by PAengineer from Practically Perfect I was looking for a faucet that kept your hands away from the sink walls at a reasonable price. i bought 3 for $150 and i cannot complain. The spout is elevated and elongated but not too much. the flow is nice. levers are crisp considering price. look for another sale to buy a fourth.